This blog chronicles a movement to correct an injustice and get an IISER to Odisha. 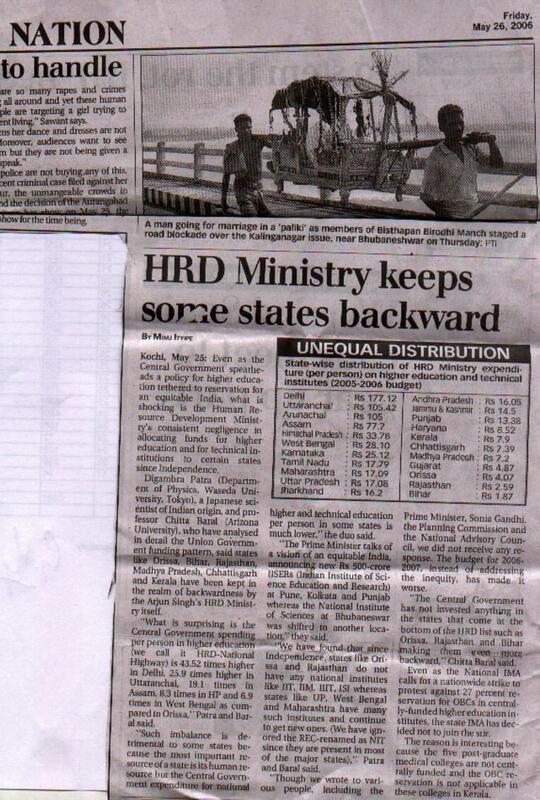 In 12/2003, the then HRD minister and the president had announced 4 National Inst. of Sc. (NIS) at Bhubaneshwar, Chennai, Pune and Allahabad. The 2004-05 announcements of IISERs at Pune and Kolkata overrode that. Thus ensued a successful movement to correct this injustice, especially with respect to Odisha. A further correction of the injustice (for which this blog was started) has been made by the 2015 budget announcement of an IISER in Odisha. The Odisha government has announced that this new IISER will be in Berhampur. This is acceptable as NISER (an alternative to IISER) was established in Bhubaneswar in 2006-07 (with classes starting in 2007) and in fact this year (2015) NISER Bhubaneswar has moved to its own permanent campus near Jatni. We applaud the BJP and its current government for announcing an IISER in Odisha. BJP was a big supporter of this whole movement from its early days and now its government has directly contributed in the establishment of an IISER in Odisha. Our next goal is to make sure that, as announced by the PM, NISER Bhubaneswar is indeed at par with IISERs. Thus we will keep a close watch on the progress of the IIISERs and NISER Bhubaneswar. We will do that in the new blog http://niser-bbsr.blogspot.com. In closing I would like to thank all those individuals and groups who supported this cause and the PM for doing what he should have done a year back. The Prime Minister, Dr. Manmohan Singh, announced the setting up of National Institute of Science Education and Research at Bhubaneswar today. “I am truly delighted to be here in Bhubaneshwar today at the Institute of Physics. I have great affection and regard for the people of Orissa whose contribution to the history, culture and economy of our nation are second to none. I am particularly delighted that my first visit to this State is associated with the announcement of the establishment of the National Institute of Science Education and Research. This is the fulfillment of a promise to the people of Orissa. Our Government is genuinely committed to the development of Orissa and to the educational empowerment of the people of Orissa. The National Institute of Science Education and Research will be a symbol of that commitment. I share the concern being expressed by many of our scientists that our best minds are not turning to science, and those who do, do not remain in science. I am told that less than 3% of school children want to pursue a career in science. We must find ways of making these disciplines more attractive to children. We have to improve the quality of teaching of science and mathematics at the school level. Countries like China and South Korea are far ahead of us in investing in science and technology. We need to do much more in this vital area if we have to keep pace with the evolving global economy of the future. We have to take urgent steps to prevent scientifically talented persons from moving away from careers in scientific research and development. This is happening at the 10+2 level and at the B.Tech. level. Most of our universities are performing sub-optimally. They lack good infrastructure and suffer from acute faculty shortage. There is not enough interaction between our academia and industry. Many technologies developed for our rural areas have not been delivered properly. We will need to address these on a war footing. I am also concerned about the regional imbalance in science teaching and the development of science and technology in India. There was a time when the East was at the forefront. Today the East is lagging behind the South and the West. We need to redress this regional imbalance. It is to meet these challenges that we will be setting up the National Institute of Science Education and Research in Bhubaneswar. As India moves up the technology ladder and improves its relative competitive status in the global domain, the need for capable innovative scientists will increase. Our higher education programs should empower young science students to engage not only in advanced research but also in domains which facilitate translation of research results into development of new technologies and their commercial deployment. This requires acquisition of necessary experimental skills and familiarity with the realities of practical world. There is a strong synergy between research and higher education. Co-existence of both leads to higher excellence in both. It provides opportunities for students to be exposed to excitements in scientific research and benefit from teachers who are themselves engaged in expanding the horizons of knowledge. Such participation in teaching also benefits researchers by way of greater clarity of thought and availability of students to broaden support to research activity. The National Institute of Science Education and Research will facilitate this synergy between research and higher education. The major strength of Institute of Physics is a strong emphasis on the quality of the faculty and its present pre-doctoral and doctoral programs are among the best in the country. The faculty is composed of all world-renowned scientists who are also established teachers. Association with the Institute of Physics will enable the National Institute of Science Education and Research to draw upon this outstanding tradition and expand it further to cater to a much larger pool of science students. NISER will be at par with the IISER being established in other places but will operate under the umbrella of DAE. It will undertake integrated 5-year Masters courses in core and emerging branches of science to provide world-class education to students after the 10+2 stage. It can also include an integrated M.Sc.–Ph.D. after graduation level. The emphasis of education at NISER will be to generate scientific trained manpower of a very high quality which could directly find placement across the country. Greater emphasis will be on branches of science relevant to the Department of Atomic Energy and also catering to the better exploitation and utilization of Orissa’s regional natural resources. Orissa’s mineral and marine resources will be taken into consideration in designing training programs of students here. While working within the DAE family and awarding degrees under the Homi Bhabha National Institute [HBNI], which is already a Deemed University for post-graduate studies, NISER will be an institute at par with the best in the country in terms of facilities and faculty. It will have a research to teaching load as practiced in the best universities in the world. This will ensure world class education and also attract the best researchers. It will have world-class experimental facilities in all the current and emerging branches of science including physics, chemistry, modern biology and environmental sciences. We will provide enough resources to DAE to convert this into reality within a very short time frame. In order to attract bright young students to this integrated course, it is proposed to make the course challenging on a world-class level, give reasonable stipend to the students and also allow them time for research activities even during their student days. There will be campus interviews and placements at both research centers and in industry in order to make the course more attractive to the students in the present competitive environment of market forces which drives them to IT-related jobs. I am told that this project will be quickly completed in two phases. In Phase-I, additional courses will be started immediately in 3 or 4 selected subjects like physics, mathematics, chemistry and biology with existing faculty and new faculty. In Phase-II, 200 acres of land will be acquired around Bhubaneswar and activities expanded on a larger scale. When completed, I am confident that the National Institute of Science Education and Research will become a Mecca for science just as TIFR and IISc are today. With our recent unprecedented economic growth, I am optimistic that India will become a ‘developed country’ in the not too distant future. In this process, Science & Technology will continue to play a major role. Since independence, there has been a great deal of progress in our S&T system. This is evident from the success of the mission-oriented S&T agencies, like the family of DAE institutions, that have made our nation proud. However, I am aware that we must increase our expenditure on Science & Technology. India’s expenditure on S&T is about 1% of our GDP. This is half of what developed countries are devoting to S & T. The Government is committed to increasing R&D funding. For the last few years, we have been allocating larger budgets for R&D. For example, last year, we increased it by 20%. We shall strive to reach the target of 2% in the 11th Plan. But I also expect the private sector to do more in this area. We also need more public- private partnership in R&D in all areas of S&T. One way of making careers in science and technology attractive would be to improve remuneration and ensure the integrity of selection processes. It is well known that the initial starting salary for scientists with a PhD in India is often lower than those of Engineers, Doctors and Management graduates. It is obvious that if talented young people are to be retained in science, scientists have to be treated differently than other Government employees in service and salary matters. The Government will be happy to provide career support for students talented in science for a reasonable period, including into their initial employment years, to attract such students to scientific research. There is also a need to develop a more productive interface between the National Laboratories and the University system. Proximate national laboratories could supplement the faculty both for undergraduate and post-graduate courses in universities and colleges. Private sector enterprises should also be able to create centres for their product innovation and development in proximate national laboratories and universities. 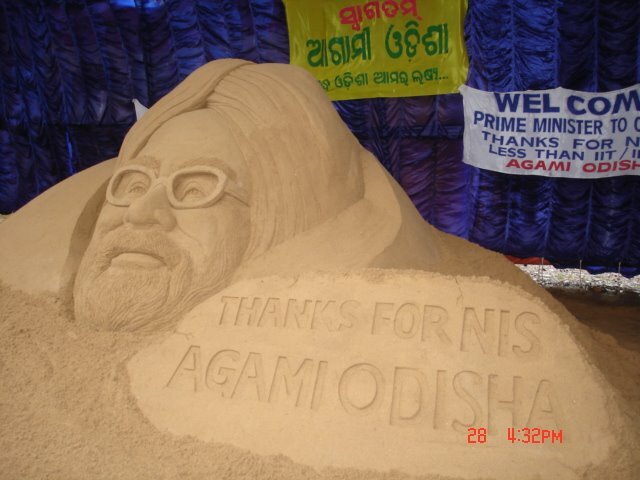 Prime Minister (PM)Dr. Man Mohan Singh will visit Orissa On August 28 and 29. It is his maiden visit after he took over as PM. 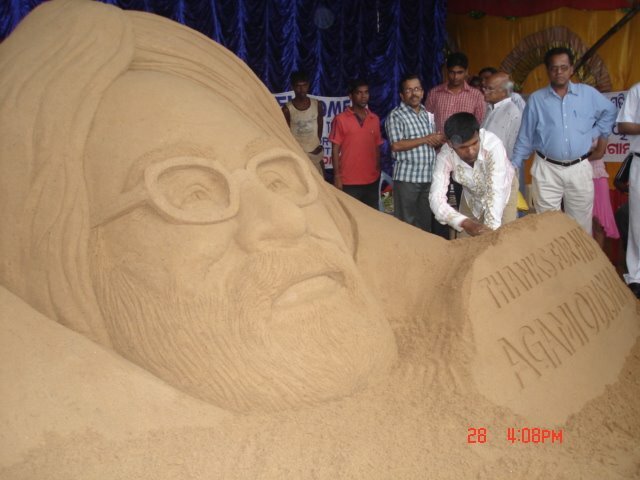 According to official sources Dr.Singh will arrive at Bhubaneswar On August 28 at 10.40 am. Then he will leave for Talcher to dedicate the Super Thermal Power Project of National Thermal Power Corporation(NTPC). On the return he will lay foundation stone of the proposed National Institute of Science(NIS) at Bhubaneswar in the afternoon. Later Dr.Singh will receive various delegations at Raj Bhawan. On August 29 , Dr. Singh will leave for KBK districts. Detailed programme for KBK is being finalized, sources said. Bhubaneswar:23/August/2006The politics over the tribal KBK is hotting up! After whirlwind tour of Naveen Patnaik to the KBK region last week, the Congress has planned to put Prime Minister Manmohan Singh against the Orissa Chief Minister. The Prime Minister is on his way for a two-day tour to Orissa on August 28. The PM would spend a full day in KBK region, obviously to upset Naveen’s apple cart. The PM’s Orissa tour was finalized after some hours after Naveen making anti-Centre statements at a party meeting here on August 23. Earlier on the day, Naveen had told his party men that the Centre’s anti-Orissa stand would be main plank in the ensuing three-tire panchayati raj elections in the state. Naveen mentioned the issues like shifting of National Institute of Science(NIS) from Bhubaneswar to Kolkata and KBK as the weapons against the UPA government and also the Congress. He urged the party men to take the messages to villages and apprise the people that the Congress led UPA Government are against the people of Orissa. Interestingly, the PM’s programme includes foundation stone laying for the NIS in Bhubaneswar. “In this way the UPA Government would prove that Naveen has been misleading the people on several issues,” said a senior Congress leaders adding that when the PM himself will lay the foundation stone, how the Centre can betray hopes of Orissa people. This apart, the PM during his tour to KBK will also prove that Naveen is also wrong so far as the Revised Long Term Action Plan (RLTAP) for the KBK region is concerned. Naveen has been taking a lot of political mileage by announcing the Biju KBK Plan for the tribal districts. The Orissa CM has also announced that the State Government had no alternative than announcing the Rs 600 crore new package for the KBK as the UPA Government has “Betrayed” the people of KBK region. During his tour, the PM is expected to announce some thing “Big” for the KBK region in order to ensure that Naveen fails to take political mileage from the issue, said a senior political observer. Besides, the Congress leaders also hope that to counter Naveen’s much-hyped Gopabandhu Gramin Yojana for 11 coastal districts, the PM may announce lucrative package for the flood affected people in this region, expects Congress leaders. The PM’s tour is expected to generate much heat in coming days, so far politics is concerned. PUNE, AUGUST 16:Nearly a decade ago, the number of papers published by Indian scientists in international journals used to be close to 11,000, while Chinese scientists could manage only 10,000. But last year, while Indian scientists published over 19,000 papers their Chinese counterparts managed a whopping 50,000 papers. ‘‘Leave aside Europe and the US, look at the huge investments made by countries like China, Korea, Taiwan and even Singapore in the field of education. Our investment figures cannot be compared with them. To address this issue, I made a presentation — Some Statistics and Some Concerns — on July 8 to the deputy chairman and senior members of the Planning Commission,’’ director general of Council for Scientific and Industrial Research (CSIR) R A Mashelkar said. Pointing to China, he said the Chinese government was pumping in $125 million in each of their 10 universities. ‘‘Moreover, $225 million each will also be invested in Beijing and Tsinghua universities. Similar investments are also planned for 20 other universities,’’ he said. He said the Chinese objective was to have 100 top class universities that will figure in the best 500 universities of the world. Hence, Mashelkar has suggested a two-pronged strategy to meet the challenge of maintaining competitiveness in the Indian research and development scenario — supply and demand driven strategy. ‘‘Supply driven strategy means creating high quality manpower through institutes like Indian Institute of Science, Education and Research (IISER). In demand driven strategy, policies have to be formulated in such a way that it fosters the spirit of competition among the institutes,’’ he said. Mashelkar said the country will soon have to address lack of top grade human capital for maintaining its competitiveness. ‘‘In fact, Indian National Science Academy, New Delhi, and Indian Academy of Sciences, Bangalore, have prepared a concept paper on ways and means to promote scientific human capital. This paper will be presented to the President, the Prime Minister as well as the Human Resources and Science and Technology ministers within the next 10 days,’’ he said. Mashelkar said issues like creating new institutes like IISER as well as supporting existing universities have been included in the paper. AHMEDABAD, AUG 3: The final report of a group of management institutions, to be submitted to the Moily Committee in the next few days, has suggested setting up three new IIMs, besides the one already proposed for Shillong. This will ensure “more balanced access to management education across the country”. The group has said, the three new IIMs should be located in cities that not only can attract good faculty but also gain from the industry-business interface. Chairman of the group Samuel Paul told FE the new IIMs should “not be set up in backward areas but in places which are emerging industrial hubs”. While the group left the choice of location to the government, Paul indicated IIMs could be set up in emerging economic hubs like Pune. “ Maharashtra does not have an IIM and can do with one,” he said. Other possible locations are Mumbai, Delhi and Chennai. Besides catering for the long-term management education needs, the new IIMs will also ease the burden of the quota regime implementation on existing IIMs. “Though it will take at least 5 years for a new IIM to come up, it will still be a exercise worth the while. Existing IIMs cannot be realistically expected to shoulder the entire responsibility of quota implementation,” Paul said. The group had highlighted infrastructure and faculty constraints existing IIMs would face if they were forced to implement the OBC quota from the next academic session. The next 2 iisers in Kerala and central India -- what will be in BBSR? BANGALORE: Here’s some good news for engineering aspirants in Karnataka. The Prime Minister’s scientific advisor C N R Rao is batting for an IIT in the state. The Scientific Advisory Council to the PM (SACPM), which has over 30 eminent scientists from all over the country, has recommended setting up of three IITs including one in Karnataka. The state’s pending demand for an IIT is finally being pushed forward by the eminent scientist from Karnataka. “Though there are a number of engineering and technical institutes, there is just one IIT in South India. We need more premier institutes here,’’ said Rao, who also heads the standing council of IITs. The SAC-PM’s recommendations come at a time when anti-quota activists were silenced with the Centre promising them more IITs and IIMs. The Karnataka government has already submitted a proposal to the HRD ministry expressing its interest to house an IIT. If accepted, the existing National Institute of Technology (NIT) at Suratkal would be upgraded to an IIT. “We’ve been pushing for an IIT for years. Since Bangalore has an Indian Institute of Management, the Centre is hesitant to sanction another institute of national importance,’’ said D H Shankaramurthy, higher education minister. With the scientific adviser himself recommending it, the minister hoped the Centre would respond positively. Shankaramurthy will meet Rao to extend all possible support from the state for establishing an IIT. Two high-powered committees under M Anandakrishnan and S K Joshi have recommended granting IIT status to seven institutes in the country, including two in the South. The institutes are AMU’s Engineering College and Jadavpur Engineering College, Cochin Engineering College, Bengal Engineering College in Shivpur, Osmania Engineering College, University College of Engineering , Hyderabad, and Institute of Technology, Banaras Hindu University. To promote science education, two more Indian Institutes of Science Education and Research (IISER) would be set up, apart from the ones at Kolkata, Pune and Mohali. “The fourth institute will be set up in Kerala as the state doesn’t have a central university. Another would be in central India,’’ said Rao. Pune, July 21: A DAY after the Independence Day, when nearly 70 students walk into the National Chemical Laboratory campus on August 16, it will be a new dawn for science education in the country. For, the Indian Institute of Science Education and Research (IISER) — touted as the IIT of science education — will start its academic session. To begin with, it will be based at the NCL’s Innovation Park and classes and labs will be held here till the institute shifts to a permanent campus. IISER in Pune and Kolkata was formed on the recommendations of the C N R Rao-led Scientific Advisory Committee to the Prime Minister. On October 4, 2005, Pune Newsline had reported about the scope and functioning of the institute. ‘‘The institute is at an embryonic stage and NCL will provide support in the form of administration, finance, engineering services as well as infrastructure,’’ IISER project director and NCL chief S Sivaram said. The 100-acre permanent campus that will come up in the NCL premises itself, will be ready in 15 months. ‘‘The academic building of IISER, with more than 30,000 sq ft of built-up area will be ready in the next 15 months. A 100-room hostel, with twin accommodation will also be built on the campus,’’ eminent scientist and the first director of IISER, Pune, K N Ganesh said. The first batch of students is being drawn from the extended IIT-Joint Entrance Examination list. ‘‘There was a counselling session at the IIT-Kharagpur extension centre in Kolkata, which was attended by 180 students,’’ Ganesh said. Call letters have been sent out to 83 students, while 10 seats (five each) have been reserved for Kishore Vaigyanik Protsahan Yojna scholarship holders and winners of Olympiads in mathematics, physics, biology and chemistry. The IISER students will receive Rs 3,000 as fellowship per month. ‘‘We have sent out more call letters than our capacity because many selected students might not turn up as they have taken admission in other institutes,’’ Ganesh explained. IISER, Kolkata has sent out call letters to 79 students. In the first year of its existence, a team of seven in-house faculty members, who have a background in research and teaching will guide the students at IISER. Besides, a list of eight adjunct faculty members, comprising prominent scientists, have also been finalised. At full capacity, IISER, Pune will have close to 3,000 students, who will be guided by 200 faculty members. Sambada: Dept of Atomic energy is preparing the details of the proposed "National Institute of Technology & Science"
Such an institute will be acceptable if its budget is of the order similar to an IIT, IISER or IISc or more, and if it takes students through IIT-JEE. It would have been better to call it "Indian Institute of Technology and Science" rather than "National Institute of Technology and Science". Whatever it is we would be happy if it is in the scale of an IISER or IIT or IISc. BHUBANESWAR: Centre has approved the proposal for upgrading four ITIs in the State into centres of excellence with World Bank assistance this fiscal. The ITIs are located at Berhampur, Balasore, Hirakud and Talcher. Union Minister of State for Labour and Employment Chandrasekhar Sahu on Friday announced this at a news conference here. A National Institute of Science (NIS) would also be set up in Bhubaneswar. Sahu said Prime Minister Manmohan Singh gave this assurance to a delegation of State Congress, which called on him in New Delhi recently. The NIS issue had sparked off a controversy after the UPA Government dropped a proposal floated by the preceding NDA government for setting up such an institute in the City. The State Government had identified 75 acres of land for this on the request of the University Grants Commission. Besides, the ESI hospital at Rourkela would be converted into a model hospital with central assistance. The Labour and Employment Ministry has decided to open a sub-regional office of the Employees’ Provident Fund Organisation at Keonjhar, Sahu revealed. This was a long-standing demand of the employees of the area. The Union Minister of State for Labour, Chandra Sekhar Sahoo on Friday claimed that the Indian Institute of Science would be set up in the Orissa. Addressing a Press conference here on Friday, Sahoo said that he had met Prime Minister Manmohan Singh in New Delhi in this connection. According to him, the PM categorically assured him that the institute would be set up in the State. Taking the Prime Minister's assurance, no one should be worried about the IIIS any more, he said. He further said the UPA Government has given due priority to the setting up of such an institute in the State. He further said the Centre this year has accorded status of Centre of Excellency to the four ITIs of the State. These ITIs are Berhampur, Balasore, Talcher and Hirakud. The Berhampur ITI will be treated as a centre of Excellency for Instrumentation, Balasore as Eelctrtcial, Talcher as Production and Manufacturing and Berhampur as Automobile. The Centre would provide Rs 3 crore to each of these institutes. He further said the Centre is actively considering giving more assistance to the ITIs of Bhawnipatna and Puri for infrastructure development. He further informed the Centre has no plan to take off the Revised Long Term Action Plan (RLTAP) from the KBK area. He also announced the sub-regional office of Provident Fund would be opened in Keonjhar.Pradesh Congress President Jayedev Jena, who was present in the conference, said steps have been taken to prepare the Congress for the upcoming Panchayat elections with 30 observers appointed for the purpose. BHUBANESWAR: Chief Minister Naveen Patnaik on Thursday reiterated the demand for extending the Revised Long Term Action Plan (RLTAP) being implemented in KBK districts to the Eleventh Five Year Plan. Naveen raised the issue during his meeting with Prime Minister Manmohan Singh in New Delhi. He said while the RLTAP had a positive impact on the living condition of the people of the area, continuance of the programme is imperative for improving the human development indicators in the KBK region, which is one of the poorest region in the country. The Chief Minister expressed concern over reports that the Centre is considering to discontinue the programme after the 10th Five Year Plan on the ground that the development needs of the area would be addressed by the newly-formulated Backward Region Grant Fund Scheme (BRGFS). He maintained that the RLTAP has enabled major interventions at the regional-level for food security, health services, rural connectivity and literacy drive. This would not be possible under the new scheme, he said. The Vijayawada-Ranchi Security Corridor proposal, which has already been approved by the Planning Commission and ministries of Home Affairs and Road Transport, was also raised by the Chief Minister. Requesting the Prime Minister to clear the proposal, Naveen said the proposed highway, which would pass through the extremist-affected states of Andhra Pradesh, Orissa and Jharkhand, would enable better policing and improve the economic lot of the people. Besides, Naveen iterated the demand for establishment of a National Institute of Science (NIS) in Bhubaneswar for which 75 acres of land have been identified by the State Government. The proposal was dropped on the ground that the University Grants Commission is not competent to set up such institutes. The Chief Minister demanded that the proposal should be revived and a NIS set up a la centres in Pune and Kolkata through the Human Resources Development Ministry. The Prime Minister is reported to have sounded positive consideration. Chief Minister Naveen Patnaik on Thursday met Prime Minister Manmohan Singh in New Delhi and reiterated Orissa Government's demand for extension of the KBK programme into the 11th Five-Year Plan. It may be noted that Government of India is considering to discontinue the programme after the 10th Five-Year Plan. Patnaik informed the PM that the on-going Revised Long Term Action Plan (RLTAP) for KBK region, has had a positive impact on the living conditions of the people. "The continuance of the programme is imperative to improve human development initiatives in the KBK region," he said. Patnaik said the present programme has enabled major interventions at the regional level such as food security, health services, rural connectivity, literacy driver, which would not be possible under the new Backward Region Grant Fund Scheme. Patnaik also requested the PM to clear the Vijayawada-Ranchi security corridor proposal, which has already been approved in principle by the Planning Commission and by the administrative ministries like Home and Ministry of Road Transport and Highways. The road would enhance the economic potential of the tribals. Chief Minister also took up the issue for establishment of a National Institute of Science in Bhubaneswar. He requested the Government to revive the proposal. Kolkata: Prime Minister Manmohan Singh has called for the "reconstruction" of the university system in the country and stressed the need to recognise the contribution of the private sector in its expansion. "We must evolve a cooperative partnership for harnessing all possible resources," he said here on Tuesday, after laying the foundation for the Indian Institute of Science Education and Research. "The deteriorating health of our universities in the past two decades has hobbled our scientific research base" which has not grown fast enough, commensurate with need. The reconstruction of the university system "must be a top priority and the issue has to be addressed comprehensively, not in a piecemeal fashion, he said. Dr. Singh said: "We will promote public-private partnerships to increase funding for frontier areas of scientific and technological research, de-bureaucratise science and technology institutions and ensure their academic autonomy. "We cannot have pretensions about being a leading `knowledge power' if we do not substantially upgrade our scientific and technological expertise — both in quality and quantity. "We will commit adequate resources for a massive expansion in our higher education system so that every section of society has adequate opportunities for fulfilling their educational needs." Referring to the findings of Rand Corporation which ranks India as a scientifically proficient nation, Dr. Singh said: "We must ask ourselves how we move from the `scientifically proficient' category to the rank of scientifically advanced nations." Regretting that the weakness of the Indian scientific system has been the increasing disconnect between teaching and research, he said "universities teach, national laboratories do research, this dichotomy must end." Chief Minister Buddhadeb Bhattacharjee said the new institute would come up on 220 acres of land being provided by his Government at Kalyani. It is necessary to lay stress on higher studies and research in the basic sciences to accelerate the pace of economic development.Defence Minister Pranab Mukherjee, West Bengal Governor Gopalkrishna Gandhi, and Union Minister of State, Ministry of Human Resource Development, Mohd. Ali Ashraf Fatmi, were among those present. A similar institute would be set up in Pune and another near Chandigarh next year, C.N.R. Rao, Chairman, Scientific Advisory Council to the Prime Minister, said adding two more were expected during the next Plan period. KOLKATA: Laying the foundation stone of an Indian Institute of Science Education and Research (IISER) in Kolkata by Prime Minister Manmohan Singh on Tuesday marks the beginning of a new initiative in science education in India. Though the human resource development (HRD) ministry had announced October 30, 2005, as the date for laying the foundation stone, the function got delayed due to political reasons. According to official sources here, the Scientific Advisory Council to the Prime Minister had recommended the creation of two new autonomous institutions under the HRD ministry devoted to science education and research to be named Indian Institutes of Science Education and Research (IISER) and located in Kolkata and Pune. IISER-Kolkata, like its Pune counterpart, is a unique initiative in science education in India since it will be a research university of the highest caliber in which teaching and education will be totally integrated with state-of-the-art research, nurturing both curiosity and creativity. Though the foundation stone is being laid at the Saha Institute of Nuclear Physics at Salt Lake in Kolkata, the institute will be located in Kalyani on the outskirts of the city in Nadia district, about 40 km from here. The West Bengal government has already given land for the institute - the main objective of which would be to improve the standards of science education in the same way as that of IITs (Indian Institute of Technology). IISER will be devoted to teaching of five-year integrated Masters and post-bachelors and post-Masters PhD programmes in integrative sciences in an intellectually vibrant atmosphere. One of the objectives of IISER is to make education and career in basic sciences more attractive by providing opportunities in integrated learning of sciences and break the barriers of traditional disciplines. Therefore, IISER will promote a flexible and borderless curriculum in all disciplines of basic sciences. Consequently, all students of the integrated Master's programme will be required to take courses in mathematics, physics, chemistry and biology for the first two years of the curriculum. Apart from classroom instructions, IISER will promote the skills of students in areas such as scientific inquiry, problem solving, communication skills, computational sciences, electronics and instrumentation, workshops and glass blowing practices. IISER proposes to create advance teaching and research laboratories where students will have an opportunity to pursue laboratory experiment as well as advanced research under the mentorship of world-class faculties. The academic programme will be divided into semesters and students can choose courses for specialisation in one or more disciplines of basic sciences based on a flexible credit system. Kolkata, July 10: The Saha Institute of Nuclear Physics at Bidhannagar will have a visitor in Prime Minister Dr Manmohan Singh who would be in the city on Tuesday. After his engagement with the institute is over he will visit Raj Bhavan. The area around the institute has been cordoned off for security reasons. “Around 250 acres of land in Kalyani have been purchased for constructing the campus of the Indian Institute of Science, Education and Research. The institute is temporarily housed at Rajarhat,” Gangopadhay told Newsline. Prior to this visit the Prime Minister had visited Kolkata in November 2005 for the same purpose. However, he had to return to Delhi immediately after the capital was hit by serial bomb blasts. The Saha Institute of Nuclear Physics was founded in 1949. It grew out of the Palit Research Laboratory of the University of Calcutta and was accorded autonomy in 1951. Research in areas of physical electronics and biophysical science is carried out at the Saha Institute of Nuclear Physics. At present the institute boasts of about 125 faculty members, 20 post-doctoral fellows and 80 graduate students. Today's Sambada reports that the PM may visit Orissa on July 10th. Lets hope that this visit does happen and he clearly declares the establishment of an IISER in Orissa. * Press release 1 : Subterfuge ..
* Same day he approves the heist - Bhubaneswar out! * Request for Central university in Orissa ignored while establishing them elsewhere. The protest: What can I/we do? * What not to do? NO rasta roko, rail roko etc. please! * I am an elected represetative. What should I do? * I am deeply concerned by this. What should I do? * What can our group do in Orissa? * What can our group in Delhi/Bangalore/Mumbai/etc. do? * I am not from Orissa. Why should I care? We hope Prof. Mungekar(member, education, planning commission)'s view -new IITs in states with no IIT or IIM-prevails. * NRO's rue shifting of NIS. Oct 10 2005. * Eminent personalities write. Oct 26 2005. * High court gets involved. Oct 27 2005. * CM to PM again. Nov 12 2005. * Orissa CPI-CPI(M), Samaja, Nov 11 2005.